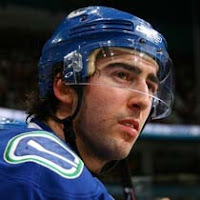 On May 29th in 2008, Vancouver Canucks defenseman Luc Bourdon, the 10th overall pick in the 2005 NHL Entry Draft, died in a motorcycle crash when he collided with a semitrailer near his hometown in New Brunswick. The accident shocked the hockey community, especially Kris Letang who missed Game 3 of the Stanley Cup Finals to attend Luc's funeral. The Canucks honored Luc at their home opener against Calgary, presenting Luc's family with his last game worn jersey and screening a video tribute accompanied by a live performance of "Big League" by Tom Cochrane. Vancouver shutout Calgary 6-0 with Bourdon's best friend Alex Burrows scoring twice and earning the game's first star. Burrows carried the momentum of that match into a 28 goal breakout season, acknowledging his fallen friend with a bow and arrow tribute from time to time. Luc Bourdon, forever a Canuck.